Amazing stats Max. You really have a knack for crunching numbers. So Catte Verdera and Whitney Oaks in Placer County, along with Serano & El Dorado Hills are going thru a transition of some kind. 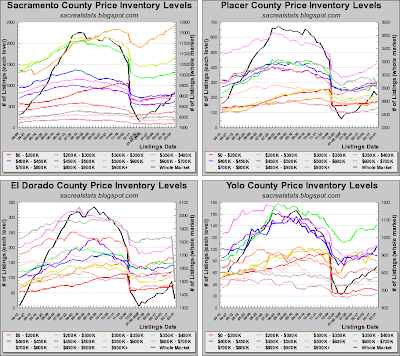 When do you think Yolo County will catch on that the high end market may be ready for a change? There are so many listings exceding $1 million it is out of balance a bit. Some of these properties have sold recently, but if you look at the data, 4 out of 5 "buyers" used 90-100% financing. With "Special Incentives", they probably got 10% cash back on the purchase. Those days may be gone now. 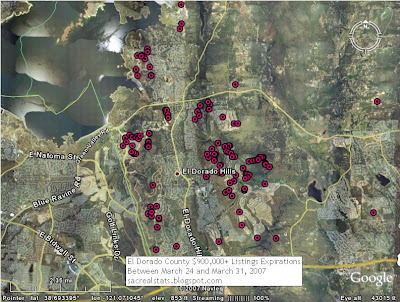 There are a many, many foreclosures happening in the upper end now. When that happens, the bagholders eat $250,000 to $300,000 per loan. It is hard to make that up in volume! Unless you have some real money, you can no longer play ball. I remember a young Russian couple buying a $900,000 house to flip in mid 2005. 100% financing. They never intended to make a loan payment and never did. Deutsche Bank foreclosed nearly a year ago and listed it for $1,099,000. They still own it and have reduced the listing to $829,000. All told, they will probably lose $200,000. And they won't make that mistake too many times before they get wise. Thus, many of the high end sellers may be capitulating and will take their properties off the market, and renting them out. Of course with a 5 year correction period, they will have a negative cash flow of $5,000/mon for 60 months and still lose $300,000. Then they can sell at a reduced price and suffer another $300,000 loss. There seem to be no good options. Of course maybe I am wrong. Perhaps all the sellers just let their listings expire so they could re-list at a higher price. They will have to compete with the builders though. There is a beautiful custom house on Lupine in Auburn which started at $1.7 million in 2005. The latest sales add says the builder will consider deals over $1.1 million. When I look back at the houses in Auburn that sold for $1.1 million in 2005 and 2006, they don't even hold a candle to the one on Lupine. Pretty amazing correction so far, and based on the stats you are showing, this may just be a prelude to the real action. Thanks for the brilliant work this week. I wonder if the ARM-reset graph provides some small hope to those of us on the sidelines that the correction may come about not in the whole-decade way but over a few short painful years. The sooner this blow-up is done, the better for all. So $325,000,000 of real estate listings expired yesterday? What does that make today? April Fools Day? This seems implausible and plausible for very different reasons. Your blog today seems to match the real estate market. I am not sure where reality is or where it is going. Fess up, is this a joke? No joke. And way more than that expired, I just highlighted those because of their effect on average market prices. 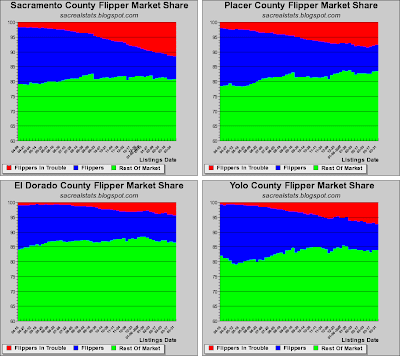 This shows how top-heavy the market really is, with a few dreamers keeping the averages high. You know, the $325M number isn't that high. 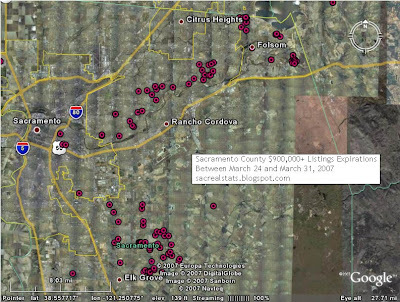 In Sac county alone, there are 9200 listings at an average price of $382K. That's a total market of about $3.5 Billion. How many people [with ARMs] cannot afford their newly adjusted payment? The answer to that question depends entirely on whether they will be able to refi, and that depends on their appraisal, and their appraisal depends on how many bubble sitters quit sitting and start buying. I doubt very much that many bubble-sitters will be hopping off of the fence any time soon, and it’s not because they don’t want to buy. A good 1/3 of the market is now unable to buy due to the sub-prime (and developing Alt-A) implosion, and there are now far fewer buyers available than just a few short months ago. As time goes on and the credit cycle turns even uglier, there will be even less, until virtually nobody without a great credit history and a solid 20% down will be able to buy (maybe 20% of today’s current buyers for a WAG.) I’d love to get some info on how many deals have fallen apart in the last several weeks due to the buyer not being able to obtain financing. Even anecdotal would be interesting. Since all RE prices are set on the margin, this large pool of buyers drying up is extraordinary bad news for the market. It seemed as if RE was making a bit of a comeback (dead-cat bounce?) late last year and early this year, but as you can see from the charts, RE has now virtually fallen off of a cliff. The Feb numbers were mediocre, but the March numbers are terrible and April/May will be shocking. Like Fleck has said, in the next 3 months, RE will basically “seize-up” and transactions will come to a virtual standstill. Panic will begin shortly thereafter and that’s when the real blood will be flowing in the streets. Sugar-plum visions of a renewed run-up or even a soft-landing will seem ludicrous in a few months, if they don’t already. These are not wild or baseless prognostications. Any reasonable study of credit cycle and RE cycle dynamics and an attempt to place the current market conditions upon a similar cycle timeline will result in the same conclusions. Look out below. Having said that, any seller that has the ability to, would be well advised to dramatically undercut their competition to secure an immediate close or risk losing huge money in the months and years to follow. Buyers should avoid the market at all costs. To potential buyers that think they see bargains at today’s prices, remember, it can and will go much lower. RE markets take many years to put in tops and bottoms, and 18 months of softness isn’t a bottom after the incredible and historic bubble run-up we had over a 8-10 year span. How would you feel if that 3/2 you just got a great deal on a $360K ends up selling for $150K in a couple of years? You might not ever financially recover from a loss like that. One more thing: The bubble-sitters have been right about market fundamentals since day one, and the bubble-deniers have been wrong since day one. 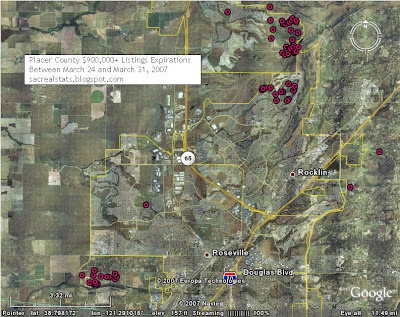 Not sure but the "sieze up" may have already happened in Fall 2006 (acounting for both new and resale). It felt similar to August '91 after the Kuwait invasion - like turning off a faucet. It must be the bottom!